Someone at Selfridges (head of home buying Geraldine James to be precise) has cottoned onto what most of us knew anyway – there’s some great furniture and design pieces from the 50s through to the 70s that look just as good today as they did when they first hit the shops. And if you drop into the store right now, you can check out the best in post-war design in their new Bunglalow section. There’s everything from sideboards and sofas, through to lamps, vases and coffee sets. 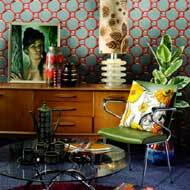 There’s even reprinted 1950s wallpaper by Cole & Son (£189 per roll if you’re feeling flush). It all looks great – but it’s very much a case of buyer beware. Most of these items can be found in junk shops, vintage retailers and auction houses at much-reduced prices if you have patience to look. If you don’t and you have some money burning a hole in your pocket, you can have your home looking like a 60s showhome in no time. The Bungalow section can be found on the lower ground floor of Selfidges, Oxford Steet, London, W1.